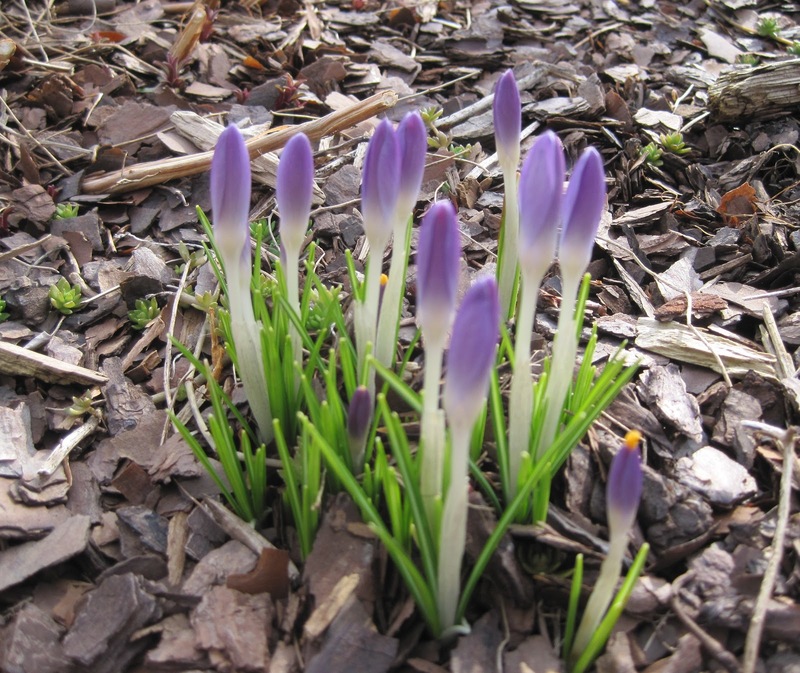 I was going to come up with a clever name for this warm, March-like February - something like "Marchuary" but that sounds too much like mortuary, which reminds me of death but spring is not about death, it's about life. And "no go" on Farch for obvious reasons. I think if I need a different name for this month, I'll go with Warmuary. Or Warmruary? 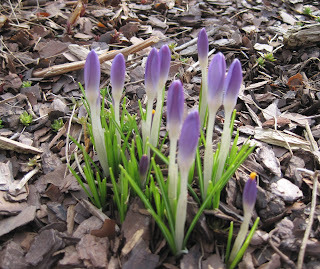 Crocuses in bud always remind me of matchsticks. I've thought for awhile about re-writing my GADS post from four years ago but I keep getting distracted and end up doing something else instead. (That is an example of subtle humor). Maybe I should do a video version? I need to start weeding before the end of Warmuary. Or is it Warmruary? This is my 1,864th post on this blog. If the average number of words per post is somewhere between 200 - 400 words, which sounds about right, then I've written somewhere between 372,800 and 745,600 words. I wonder how many words are in the average sized garden essay book? In 21 days or so, I'm going to sow peas outside in my garden. I've ordered and received all of my seeds for my 2012 vegetable garden so everyone else can go ahead and order theirs now. My "new to me" vegetable to try is Valerianella locusta. The common name is mache, sometimes called corn salad. I bought the seeds from Botanical Interests. They have the best seed packets with very complete information, including the botanical name. I just read on the back of the mache packet that the seeds can take a while to germinate, so I should be patient. Great, my seeds are telling me how to behave now. I changed the settings on this blog to no longer require word verification when commenting. I know, robots might spam me, but it should be easier to leave a comment now. I've been working on a presentation and a handout on the topic "Grow Vegetables - No Excuses". I'll be debuting this presentation at the local master gardeners spring garden clinic on Saturday. I do not plan to talk about Valerianella locusta, though it is fun to pronounce. It does make me wonder why it is when someone presents about flowers for the garden, it's considered bad form not to include the botanical names but when you present about vegetables, no one expects you to provide botanical names? In fact, if you did slip in the botanical names of vegetables, it would probably be confusing and people might think you were a haughtyculturist. I like gardens better than landscapes. For the presentation on Saturday, my stylist, Gloriosa Vanderhort, will decide what I should wear. My assistant, Jane Hortaway, will make sure I actually take the presentation with me on a thumb drive. The advice columnist, Hortense Hoelove, will be on standby if I get a lot of questions, and Dr. Hortfreud, my garden therapist, will review the experience with me afterward. The garden fairies are not invited because they would just cause trouble. If you would like to know about these characters, check out the Who's Who page on my blog. I'm going to host a giveaway in a few days. I received word yesterday that I've been nominated for Best Garden Blog on About.com Gardening. Right before I found out, I got a seat upgrade at the Pacers game to the first row. It is my lucky week. I'm considering buying a lottery ticket now. Follow the link to vote for your favorite garden blog, garden magazine, garden catalog, new gardening book and classic gardening book. If I won the lottery, I'd probably spend it all on my garden. Random garden-y thoughts can go on and on. I'll stop there. I voted for you - you are neck and neck with digging for the win... most exciting. With this warm weather one can't help but to think Gardeny. You better get out there and get a lottery ticket. Wish I could figure out how to write like I'm a robot named Miss Prissy Pots just to mess ya a little :). But really wish I could come hear your veggie talk! I'm thinking the garden fairies may make a surprise appearance (if you have trouble with your microphone/powerpoint you'll know they are there). Congrats on your blog nomination! Yes, buy several lottery tickets! Today! Your have got to ride out those lucky streaks, they don't visit very often. For me, anyway. Congratulations and good luck with the voting. May the best blog win! I would also love to hear your gardening talk, and see the fairies there, causing some mischief. You must buy the lottery ticket! I wish I could hear that talk...I know it will be fun. Sounds like you've had a good week. The lottery is a definite shot. It was marvelous to see your blog on the list! yes a few lottery tickets are necessary! I was looking at a seed exchange list and all the seeds were listed by Latin names. In the case of the veggies, I wished they hadn't. It got bad when I had to decide if I wanted Beta vulgaris or Beta vulgaris (beets or swiss chard), Brassica rapa, Brassica rapa or Brassica rapa (broccoli raab, turnips or Napa cabbage), or 6 different Brassica oleraceas (kale, cauliflower, cabbage, kohlrabi, brussels sprouts or broccoli). Only some of these were clarified with common names as an afterthought. I think common names might be better for veggies, after all. If the average gardening book is around 50,000 words, then you've written between 7-15 books! Keep writing! Buy the ticket! It is your lucky week!